Film + Music Office Director Kate Becker introducing the Sound and Vision panelists. 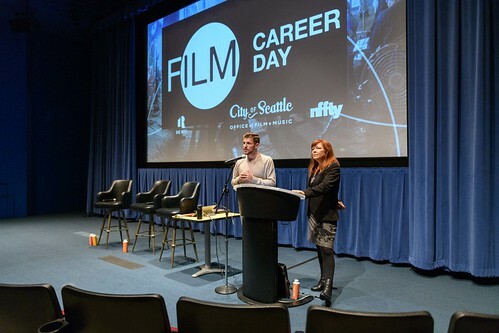 Last week, the City of Seattle Office of Film + Music, in partnership with the National Film Festival for Talented Youth (NFFTY) and One Reel, produced the first Film Career Day. Hundreds of students, educators, and young adults gathered at McCaw Hall and the Cornish Playhouse at Seattle Center for the day-long event featuring expert panels and networking opportunities with industry professionals. Speed networking at McCaw Hall. Film Career Day began with NFFTY’s speed networking session, giving attendees the chance to meet industry experts, share their stories, and build relationships. 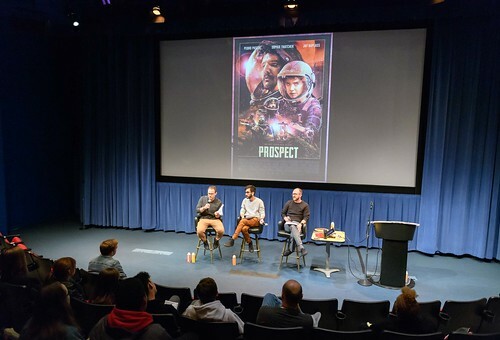 Keynote speakers Chris Caldwell, Zeek Earl, and Brice Budke, the writer/producer/director team from Seattle production company Shep Films, discussed how they got their production company off the ground and how they overcame obstacles along the way. Keynote speakers Chris Caldwell, Zeek Earl, and Brice Budke. The rest of the day featured six different panel sessions. Panelists tackled tough questions facing local young people who are pursuing a career in film—for example: Is film school worth the money and time? What are the pros and cons of starting a film career here in Seattle, versus moving to cities like LA or New York? What kind of film work is available right now in Seattle, and how can you find it? 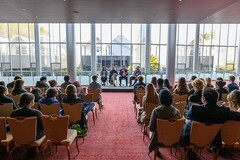 Panels also gave attendees a chance to ask questions and hear from professionals who play various roles in the film industry, from producers and directors to composers and costume designers. The “Sound and Vision” panel featured Mayor’s Film Award winner and costume designer Ron Leamon (Blue Velvet, Man in the High Castle) and film composer Mike McCready (Sadie, We Bought a Zoo); the “Should I Stay or Should I Go” panel featured Mayor’s Film Award winner Jennifer Roth (Black Swan, The Wrestler). 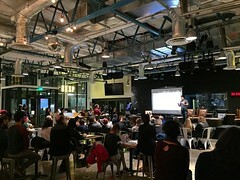 Drawing on Seattle’s reputation as a leader in Virtual and Augmented Reality technology, local experts including Xuny Haley, Operations Manager at CoMotion at the University of Washington, Kim Voynar of WonderTek Labs, and Amy Lillard, Executive Director of Washington Filmworks, held a panel on VR/AR filmmaking. Big local and national names participated in the inaugural Film Career Day, including surprise guest Mike McCready at the “Sound & Vision” panel. While McCready is best known from Pearl Jam, he has also been composing music for film and television for years. During lunch, attendees also had the chance to browse through a table fair hosted by local schools and organizations including Scarecrow Video and TeenTix, to learn about part time jobs and internship opportunities and chat with current and former film and animation students. 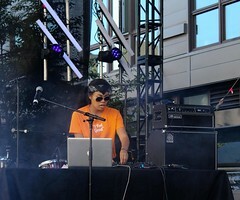 One Reel has collaborated with the City to host career days, including Music Career Day, for many years. The first Film Career Day presented a new opportunity to partner with NFFTY, who’s experience and expertise were invaluable to connecting with the youth film community. 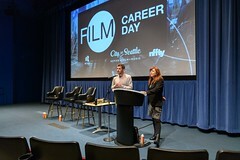 The Office of Film + Music looks forward to making Film Career Day even bigger and better next year! 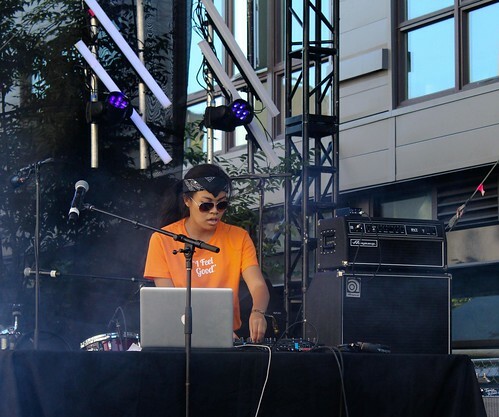 If you have ideas for things you’d like to see at 2019’s event, shoot us an email at filmandmusicoffice@seattle.gov.